Hidden in the highlands of Haa, Bhutan lies yak country. Pastureland spans across hills over 4000 meters in elevation welcoming herds and their caretakers. A cycle of semi-nomadic seasonal movements has occurred for many generations facilitating a co-evolutionary process between yak, the landscape, and herding culture. The yak graze the land regularly keeping at bay species that might otherwise become dominant, providing a unique niche for various grasses, wildflowers and shrubs. Herders develop a precise ecosystem knowledge that is shaped by, and also shapes, an underlying worldview used to interpret the landscape. What might be perceived as a ‘natural’ landscape actually reveals a uniquely managed landscape with influences from both man and beast. With ethnobiological knowledge serving as the knowledge of proximity (Johnson & Hunn, 2010), the herders have also developed a macro-level conceptualization of their landscape in which they have developed an understanding of larger bio-physical patterns that help in resource use decisions. Patterns of rainfall, seasonal vegetation growth, presence of predators, and other site-specific details have helped herders cognitively map the usefulness of the landscape and its components (pastures, forest patches, streams). Knowledge of temporal characteristics of the landscape also serve the herder as they make decisions based on declining grass quality. Burning, which has now been deemed illegal by governing authorities, was a practice used to revive pasture quality every 3 years. The presence of whitened rocks and certain shrubbery are signs of historic burn areas that now dot the landscape. 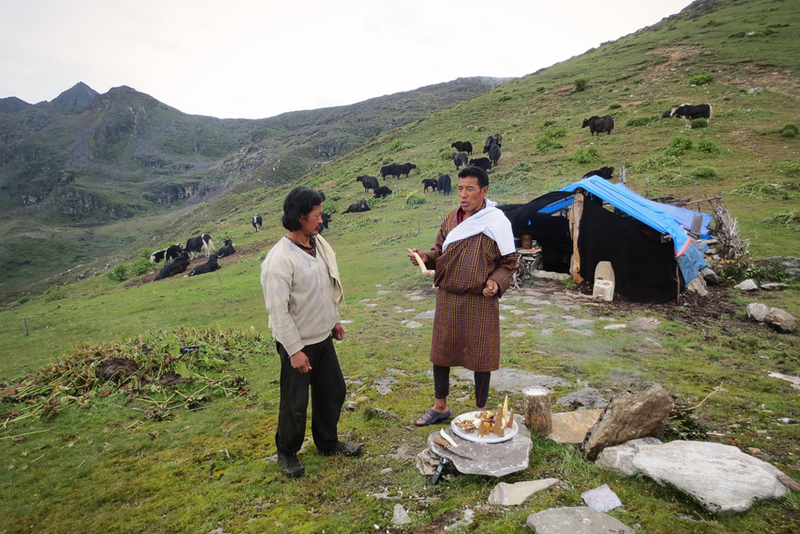 During a stint of fieldwork in July 2015, in conversation with herders, toponomy of the area was discussed, gaining an understanding for why various landscape features were ascribed specific descriptors or naming patterns. The discussion focused more on proper names assigned to specific locations (Drum Lake, Yak Pass, etc.) rather than general feature descriptions (slough, low-lying grassland, flat-topped peak, etc). The naming patterns tended to be cosmological/spiritual for water bodies, and more descriptive in land formations. For example, all the lakes in the area had names associated with the mythical figure Terton Sherab Mebar, also known as the ‘Treasure Seeker’. The Treasure Seeker, from his home region of Paro, travelled to Haa and stole a number of treasures from a lake known as Rego Tsho. In response, the lake rose up to retrieve its stolen treasure, however as the Treasure Seeker escaped, a number of treasures were dropped that were then transformed into additional lakes in the shape of the associated treasure. Thus the lakes were called “Drum Lake”, “Hammer Lake”, “Trumpet Lake”, and so on. All of the treasures were associated with common religious tools used by the Tibetan Buddhist monk body. Contrasting this, land features were given names according to non-religious associations such as “Yak Pass”, an area known well for viewing yak herds below. It should be noted that this is a generalization as a few land features also contained spiritual significance. It is my hope to revisit this discussion and concentrate more on general feature descriptions, as they may be more useful for exploring indigenous insights to resource value in specific land features. Johnson, L.M. and Hunn, E.S. (Eds.). (2010). Landscape Ethnoecology: Concepts of Biotic and Physical Space. New York: Berghahn Books. Nature is an interesting term that, according to a constructivist philosophy, does not have an essential or consistent meaning across societies. Rather, ‘nature’ seems to be a term with incorporated culturally processed significance. This understanding of nature, led Escobar (1999) to posit an ‘antiessential’ understanding of the term. This understanding sees ‘nature’ as lacking essential qualities or characteristics, acknowledging the constructivist viewpoint of applied cultural influence over time, while also recognizing the bio-physical substance of the term. However, even the ‘biophysical reality is constituted as experience’ (Escobar, 1999, p.27). Escobar (1999) notes that “nature is a specifically modern category, and many non-modern societies have been shown to lack such a category as we understand it”. This assessment is in unison with the work of Berkes (2004) who acknowledges the Systems-Based thinking present in many indigenous cultures in which the human-nature dichotomy is absent. This is not difficult to appreciate when one analyzes the history of societies that have been engulfed in post-industrialism and thus have lost connection to a biologically dependent lifestyle in favor of urban sedentariness. This disconnect has bred generations that mythicize the idea of nature as something beyond human society, an idealic untouched ‘nature’ (Fletcher, 2014). Yet to many pastoralist and agriculturalist communities, this idealized form of ‘nature’ does not exist as humans are seen as a necessary characteristic of the biological surroundings. With shrinking spatial scales between societies, due to technological advances and globalization, this has brought together competing understandings of ‘nature’. Political ecology, a historical analysis of cultural articulations of biology (Escobar, 1999), allows one to recognize competing articulations as evolved understandings containing multi-faceted cultural influences that perhaps share certain histories while maintaining distinctness manifested in differing cognitive understandings. Escobar, A. (1999). After Nature: Steps to an Antiessentialist Political Ecology. Current Anthropology, 40(1), 1-30. Fletcher, R. (2014). Romancing the Wild: Cultural Dimensions of Ecotourism. Durham and London: Duke University Press.